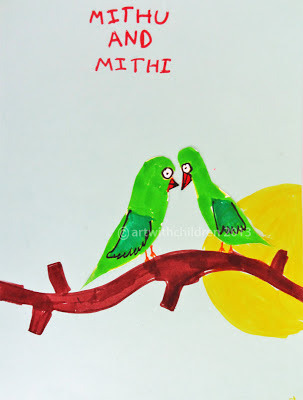 The second story chosen for the reading - story telling - craft session, was 'Mithu and Mithi' by Mohini Bakshi - published in 1971. It is a beautiful folk tale from India, about a pair of parrots called 'Mithu' and 'Mithi', who loved each other very much! A sweet tale expressing their love and friendship and how much they care for each other. The children enjoyed the story and wanted to share it with their families. They also decided to enact the tale as we read out the story aloud and watch the characters come alive!!! After working on the book covers we also made some photo frames and pasted some parrot cutouts on them! We'll be back with more stories as we explore new ones!